Over three times stronger than standard aluminum used in broadhead ferrules, the Iron Will Outfitters titanium ferrule stands firm to ensure your arrow's energy drives through your quarry instead of bending and dispersing energy across it. When it comes to once-in-a-lifetime shots, we can't leave anything to chance. Optimal materials and engineering allows us to stand behind our broadheads, guaranteeing them for life. Sharpened back bevels deliver your trophy with maximum internal hemorrhaging. And when you're tuning into a target, they ensure your broadheads return from the black hole to perform in the big game. Made to work, A2 is used in manufacturing to cut other steels, for metal stamping dies and punches, and by high end knife makers for their premium blades. A2 has a unique combination of high hardness for edge retention and sharpness along with high impact toughness for high speed bone impacts. 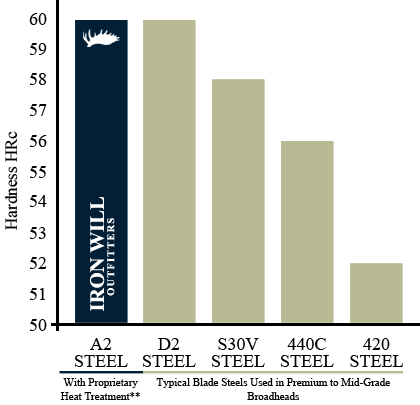 At Iron Will Outfitters, we add a proprietary cryogenic treatment and triple temper heat treat process to ensure optimal toughness, so you can rely on your broadheads at the moment of truth. *The information presented here is for typical or average values and is not a guarantee of maximum or minimum values. 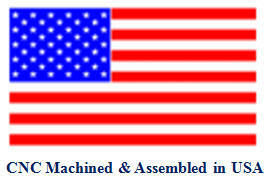 **Includes a cryogenic treatment and triple draw tempering. **Extrapolated from typical A2 Steel based on laboratory testing on actual blades with our cryogenic treatment and triple draw tempering. Over three times stronger than the standard aluminum used in broadhead ferrules, our titanium ferrules drive your arrow's energy through the animal instead of bending and dispersing energy across it. Adds weight to our 100 grain blades without creating a larger blade profile that sacrifices penetration and long range accuracy. The Iron Will Outfitters v125 ferrule is CNC machined from 17-4 PH Stainless Steel. Available on your broadhead's back bevel and/or wood packaging, so long after the hunt's finished, you can relive the epic story that led to your trophy-of-a-lifetime. And since you set your sights on multiple hunts, our laser-engraving technique is made to last. That way you can rely on your custom broadheads hunt after hunt, stacking memories and trophies along the way. *Custom engraving can be placed on both sides of the broadhead where "Iron Will" is marked. Six character max on each side of the ferrule. *Custom lettering can be applied where "Iron Will Outfitters" is marked.